A 1939 Alfa Romeo 8C has become one of the most expensive pre-war cars to sell at auction. 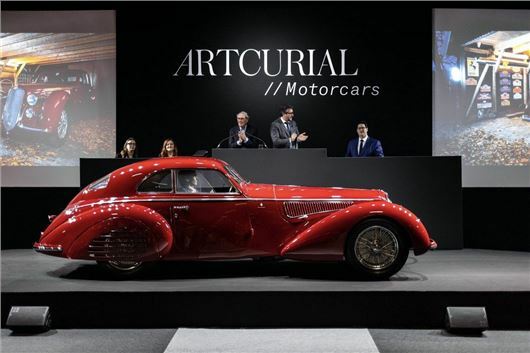 The 2900 B Touring Berlinetta went under the hammer at Artcurial’s Retromobile sale on Friday, February 8. It fetched €16,745,600 - that’s £14,655,909 at the current exchange rate. The car’s previous owner, a Dutch collector, who was sitting in the front row of the saleroom, was said to be delighted to know that his automobile would be joining the collection of another passionate enthusiast. His father had bought the car for around €10,000 some 43 years ago, and it had remained in the family since then. This Alfa is now the third most expensive pre-war car ever to be sold at auction worldwide. It is the highest price of any car sold during this week of international collectors’ car sales in Paris. It’s price of $18,977,200 puts it alongside the $22m paid for a 1935 Duesenberg SSJ and another 8C – a 1939 2900 Lungo Spider touring, which made 19.8m.